She was involved with Cheekwood for many years, and was its Acting Director from 1967 to 1968. 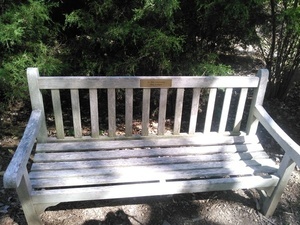 She helped establish the herb garden in which the bench sits. 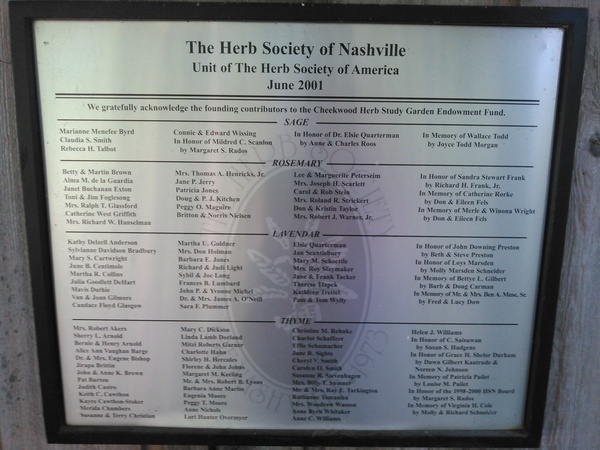 Elsie contributed to the refounding of the Cheekwood Herb Study Garden Endowment Fund at the Lavendar level, and Anne and Charles Roos contributed in her honor at the highest, Sage, level, to help the Herb Society of Nashville with this project. Charles Roos is Professor Emeritus of Physics and Astronomy at Vanderbilt. He spent thirty years in teaching and high-energy research at CERN, Cal Tech and Brookhaven. He is currently Chairman of the Board of National Recovery Technologies, a Nashville Company that he founded to research and build high-speed commercial machines for the separation of plastics and metal alloys. Anne Roos trained as an architect and has been involved in Nashville public life since arriving here 50 years ago. Her interest in community planning led to service on the Metro Planning Commission, Parks and Recreation Board and Metro Historical Commission, among many other non-profit committees. She serves as a Life member of the Board of the Adventure Science Museum and is on the Board for The Conservancy of Centennial Park and the Parthenon. The Fannie Mae Dees Park Dragon, the Athena and “Come Play” on the Peabody campus were her projects. 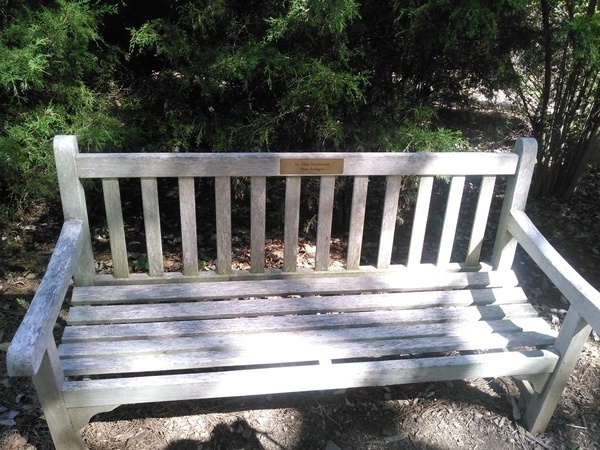 In lieu of flowers, the family asks that donations be made to Friends of Radnor Lake, Friends of Warner Parks, Cheekwood Botanical Garden and Museum of Art or any group dedicated to the enjoyment and preservation of plants and the environment. Aunt Elsie, gone, but never forgotten.